It’s important to understand that for many businesses, especially car dealers, when you answer a question like that, it may not be satisfying to customers today. It may require a little more transparency, in other words. So, while the ‘old school’ way may still be valid for some, it’s not going to work for everyone, especially for dealers who have already priced their vehicles ‘to market’. If your vehicles are priced ‘to market’ online, that’s a problem if you answer “No, we reserve our best price for people who have selected and test driven a vehicle”. 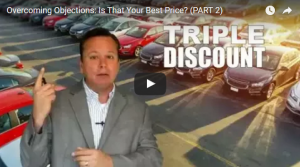 See, when you’re priced to market, the problem is most dealers get stuck with what I like to call, “the market based pricing triple discount”. So, we’ve priced our vehicles ‘to market’. That’s discount number one. Then someone calls us on the phone and they ask us, “Is that your best price? “and you know what happens – your BDC or your internet salespeople give another price. That’s your second discount. Then, when someone has already received two discounts from us, they saw our market based pricing (discount number one), they talked to our team and got discount number two. Then they arrive at our dealership and what do they want? Right away they want to negotiate that third discount. That’s ‘the market based pricing triple discount’. You can stop this with the very first interaction whether it’s on the phone or on the lot. You can keep yourself from giving three discounts when you are already at market based pricing. So, the question comes up, “Steve, if we’re invoiced priced online and then we have our matrix price and a customer comes back and says they have our price beat by, say, two or three hundred dollars, why not just give them the two or three hundred dollars that we have in reserve that we have below our matrix price?” Right? It’s because the person on the phone calling you to tell you that dealer A has beat you by two hundred has no intention of ever buying from you. Sometimes they are actually sitting at the other dealership when they make that call.